If a semicolon is used as a parameter separator in Microsoft Excel, use semicolons instead of commas in formulas. You may use cell values as formula arguments. In the example above, all the RTD formulas in the table are the same. The tickers are in column B, and the data field names are in the table headers in row 3. RealTimeToExcel loads data directly from Yahoo! Finance, Google Finance and MSN Money websites and web services. Any provider may change data formats or URLs, or even stop publishing data. As a result of changes, RealTimeToExcel may not load data. We at Gartle Technology Corporation try to modify RealTimeToExcel to address issues as soon as possible, but this requires some time. You may notify us that any provider stops getting data. You may find multiple examples of different data providers in the RealTimeToExcel Examples folder of the downloaded package and the installation folder like %ProgramFiles%\Gartle\RealTimeToExcel. Use these examples to test features quickly and troubleshoot formulas or loading data. Database providers (like rtd-sqlce, rtd-mysql, etc.) must be configured for connecting to target databases. Table names, key columns, and data fields depend on databases. Configuring databases is not required. See details in Database Providers. You may use special tick fields for number data fields. Add the :tick suffix to the data field name. 1 The value is changed up. 0 The value is unchanged. -1 The value is changed down. Tick fields can be used for conditional formatting of the underlying fields or as independent columns. You may use special data fields to monitor downloading and processing data. 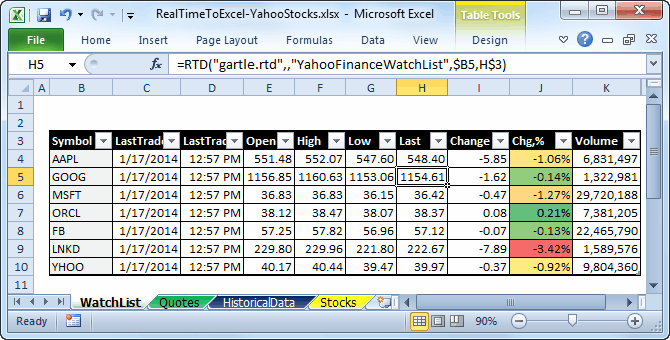 The formulas above show the last data update time and the last error code for the YHOO ticker. See a complete list of the special data cells in RealTimeToExcel Fields. Yahoo! Finance publishes delayed quotes and financial data free of charge for non-commercial use. RealTimeToExcel default settings comply with Yahoo! Terms of Services. RealTimeToExcel loads data from the MSN Money website using undocumented features. You may change some of the application settings. See RealTimeToExcel Settings. The most useful setting is the Yahoo! API key that allows refreshing data more frequently. You may configure the setting file using a Start Menu shortcut. Every data provider has time periods of refreshing data and refresh intervals. See a general description of Data Provider Settings and specific data provider settings in the provider topics. You may change default settings using Data Provider Manager or directly in configuration files in the DataProviders folder. RealTimeToExcel is configured by default for working 24 hours a day with different refresh intervals.